With the arrival of the newer formats and an increased emphasis on physical fitness, fielding skills have become indispensable for a cricketer. Fielders with lightning fast reflexes are always preferred by the selectors. MECA does thorough fielding skills analysis of every sportsman and trains them further. 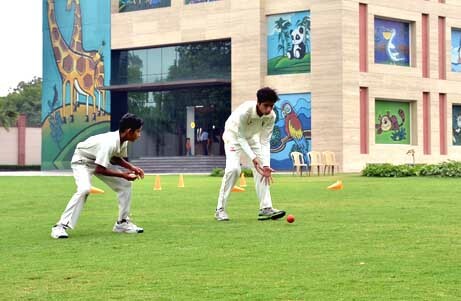 The fielding training sessions are aimed at honing the athletic capabilities of the boys and sharpening their reflexes through exercising and continual practice sessions. A special emphasis is given to the techniques for catching and aiming the throw. With sprints and long distance runs in their training schedules, players are trained to sustain their fielding vigor for long intervals. There are many exercises for sharpening the reflexes and quickening the synapses of the fielders. MADE EASY – a name synonymous for success in ESE, GATE & PSUs exams, founded by Mr. B. Singh a distinguished alumnus of prestigious IIT -BHU and a renowned educationist, who had a vision to develop a Cricket academy that would be state – of – the art facility.